The heat and humidity are no bother to Ricardo Goenaga as he walks from tree to 9-foot-tall tree in an experimental plot ARS maintains in Isabela, on Puerto Rico’s northwest coast. The plant physiologist picks a red, spiky, Ping-Pong-ball-sized fruit from one tree and uses his thumbs to peel it open and reveal bright, off-white flesh. He takes a bite. “A bit bitter,” he says. He’s right. The pulp inside this curious offering’s soft skin—the reddish fruit resembles one of those squeeze toys covered by long, rubbery spikes—has the sweet taste of a pear. 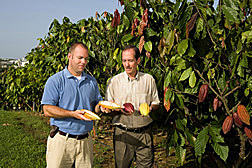 Horticulturist Brian Irish (left) and plant physiologist Ricardo Goenaga inspect cacao pods. The Mayagüez repository maintains a genetically diverse collection of cacao, comprising almost 200 accessions. 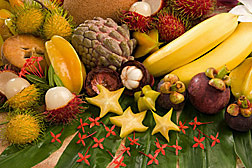 While rambutan and other fruits such as mamey sapote (mam-EY sa-PO-tey), lychee, longan, carambola, mangosteen, and sapodilla may not be typical stateside fare, they are often the center of attention at TARS. Much of the research there revolves around seeing these offerings on stateside shopping lists one day. 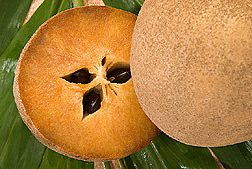 Mamey sapote is one of many tropical fruits found in the ARS germplasm repository in Mayagüez, Puerto Rico. “Increases in health consciousness and ethnic diversity have greatly expanded the market for tropical fruit in the United States,” says Goenaga, who is the station’s research leader. “But there are major obstacles—such as pests, diseases, drought, and acidic soils—that keep growers from capitalizing on this. For example, unless irradiated, rambutan can’t be imported into the United States because of concerns that it may introduce fruit flies. TARS scientists study large-scale cash crops as well as little-known exotic ones. And the station is one of three ARS repositories—keepers and guardians of genetic material known as “germplasm”—for tropical and subtropical plants. “We safeguard cacao, banana, and plantain, as well as sapodilla, mamey sapote, Spanish lime, tropical and temperate bamboo, and species of Annona and Garcinia,” says Goenaga. He says that while some exotic fruits won’t be exportable to the continental United States any time soon, there is a glimmer of hope for mamey sapote, Pouteria sapota, courtesy of work led by entomologist David Jenkins. This cantaloupe-sized brown fruit—it resembles a small coconut, while its sweet, refreshing flesh is reminiscent of almond-flavored ice cream—is a favorite niche product in the United States. “It’s especially prized by the Cuban community but is also enjoyed by other ethnic groups,” Jenkins says. Import of mamey sapote from Puerto Rico has been restricted by concerns that it may host the West Indian fruit fly, which is not currently present in the continental United States. Jenkins and colleagues recently found evidence that the probability of fruit fly infestation in mamey sapote is extremely low in Puerto Rico. “This is one step toward making this fruit eligible for export,” says Jenkins. His team recovered no adult fruit flies from more than 1,100 mature mamey sapote fruit collected throughout the year. “We also exposed the fruit to mature female fruit flies for 2 days,” he says. 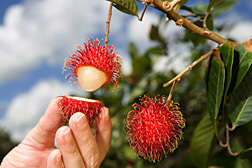 “No eggs, larvae, or adults were recovered from any of the fruit.” Experiments in rambutan are yielding the same results. In contrast, mangoes, identically exposed, yielded large numbers of fruit flies. Jenkins cautions that experimental procedures following USDA Animal and Plant Health Inspection Service protocols must now be conducted to determine mamey sapote’s final host status for this and other fruit flies. On a day-long journey, Goenaga drove the island’s mountain roads to TARS experimental sites in Isabela, with its fine, well-drained soil, and in Corozal—southwest of San Juan—where the damp, clayey hills offer deep, strongly acidic, and poorly drained terrain. In Santa Isabel, on flood plains off the semiarid south-central coast, the soil is deep, well drained, and fertile. 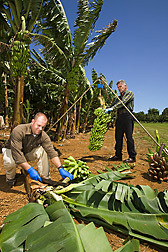 The large-scale cash-crop research at TARS focuses on bananas and plantains (in the Musa genus), cacao, papaya, beans, and sorghum. “We introduce and evaluate new accessions of these crops and distribute disease-free plant genetic material from them,” says Goenaga. Horticulturist Brian Irish and Goenaga work to preserve and evaluate Musa. “These are among many tropical and subtropical crops whose germplasm resources have been reduced by human activity, pests, diseases, and weather-related causes,” says Irish. 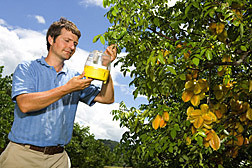 In a study of the fruit’s potential as a host to fruit flies, entomologist David Jenkins inspects a fruit-fly trap on a carambola tree. While high genetic diversity exists in Musa’s centers of origin in Southeast Asia, Irish says that uniformity requirements for dessert bananas have diminished diversity in cultivated bananas and led to a reliance on Cavendish types. Though extremely popular for their high yield and good taste, Cavendish varieties are very susceptible to important insects and pathogens. “We’re currently evaluating Musa germplasm accessions in our collection as potential alternatives to Cavendish types,” says Irish. In all, TARS holds 29 accessions of plantain and 92 accessions of banana, representing popularly grown cultivars, insect- and disease-resistant cultivars, and other previously uncharacterized varieties and plant introductions. Irish also serves as curator for cacao, managing a collection that was reestablished in 2000. Technicians Elkin Vargas (foreground) and Nicolas Diaz harvest rambutan fruit from an experimental orchard. “There’s no doubt that we are breaking a lot of ground, both on exotic fruit and larger-scale tropical and subtropical crops,” says Goenaga. “Some of these exotic fruits are now close to being ready for the export market. “But the future here at TARS is in the germplasm,” he adds. “We need as much genetic diversity in our collections as possible so that we can evaluate and identify materials with superior horticultural traits and thus ensure success and sustained production for the emerging tropical fruit industry.”—By Luis Pons, formerly with ARS. This research is part of Plant Genetic Resources, Genomics, and Genetic Improvement (#301) and Crop Production (#305), two ARS national programs described on the World Wide Web at www.nps.ars.usda.gov. Ricardo J. Goenaga is with the USDA-ARS Tropical Agriculture Research Station, 2200 P.A. Campos Ave., Suite 201, Mayagüez, PR 00680-5470; phone (787) 831-3435 ext. 226, fax (787) 831-3386. Here are some details about other fruits being studied at ARS’s Tropical Agriculture Research Station, Mayagüez, Puerto Rico. 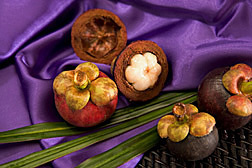 Mangosteen, Garcinia mangostana. This “Queen of Fruits,” as it’s known in its native East Indies, has a red/purple, edible rind and fragrant, sweet, and creamy flesh that tastes like citrus and peach. It’s not related to mango. Scientific challenges: Mangosteen’s tropical evergreen trees take 8 to 15 years to start bearing fruit, a characteristic that worries potential growers in storm-prone areas. Scientists are trying to accelerate its growth or make its juvenile stage shorter. 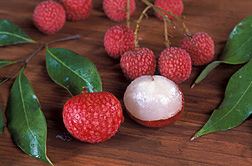 Lychee, Litchi chinensis. This oval fruit is a little more than an inch in diameter and comes from China. It has a hard, scaly, reddish and inedible cover, but sweet, whitish, grapelike edible flesh that surrounds a single large seed. Scientific challenges: Only a few of the approximately 70 known varieties of lychee have been studied or evaluated. Selection of superior varieties with high yield potential is essential for industry expansion. 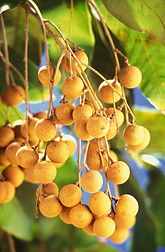 Longan, Dimocarpus longan. This relative of lychee has small, pulpy fruit produced by a Southeast Asian evergreen tree nicknamed “dragon eye” because its fruit has black seed that shows through translucent flesh, resembling an eyeball. Its thin, brown shell is inedible. Scientific challenges: Major problems associated with longan production are overcropping and alternate bearing—the tendency to bear a large crop of fruit one year followed by little or no fruit the next year. Best management practices for high-yielding cultivars are needed. Carambola, Averrhoa carambola. Known as “starfruit,” this offering is also of Southeast Asian origin. It’s a five-angled, green-to-yellow tropical fruit with a star-shaped cross-section and edible skin. Its tart-sweet taste resembles that of apples or grapes. 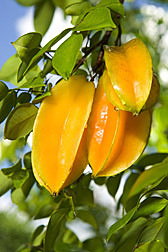 A good source of vitamin C and antioxidants, carambola is commercially grown in Florida and Hawaii. Scientific challenges: Selection of rootstocks that adapt well to alkaline and acid soils in the Tropics and Subtropics is needed. 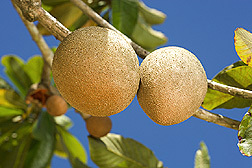 Sapodilla, Manilkara zapota. This round to egg-shaped fruit is 2 to 4 inches in diameter, with rough brown skin. The flesh—it varies from yellow to reddish-brown—can be smooth or grainy. It has an extremely sweet flavor. Scientific challenges: Selection of rootstocks promoting tree dwarfing and development of resistance to various root weevils are of critical importance. "Fruitful Studies in Puerto Rico" was published in the January 2008 issue of Agricultural Research magazine.